As our ministry grows and we begin to work with more and more worthy ministries we want to be able to provide the same effective training and encouragement to all our ministry partners. Earlier this year we developed an online resource within our website that we call Launch Pad. We have used this to post encouraging and challenging videos, training materials and even ask our ministry partners questions that they can answer in Launch Pad. Each post is about a specific topic that is tailored to fit the particular fundraising season our ministry partners are in. A ministry partner can learn all about putting together a fundraising plan, get ideas, and turn their plan in to us all using Launch Pad. We then provide them with feedback, questions and ideas to help hold them accountable and put their plan into practice. When we first started, Launch Pad required a password so only our ministry partners could use it, but we just recently opened it up so anyone can access it, with the hope of being able to help even more ministries. 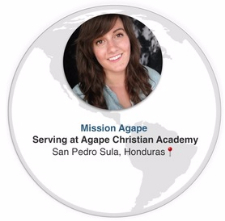 Sarah Cargin is in San Pedro Sula, Honduras teaching kindergarten at Agape Christian Academy, along with serving as a missionary at a small church, Ministerio Gracia y Paz. Both Agape Christian Academy and Ministerio Gracia y Paz strive to invest in the lives of the people of Honduras. Agape Christian Academy does this through educating Honduran youth through Christ-centered education. Ministerio Gracia y Paz ministers to those living in poverty, orphanages, and hospitals by providing food, school supplies, and spiritual support. Joy Klee, our Financial Operations Coordinator, is due to have baby number two in mid-October. and plans to take off the next several months. We are working to find some help in the office while she is gone. Please pray for Joy in her last trimester of pregnancy and pray that we find someone who is able and excited to take over her work. As the summer ends we are moving into a "year-end fundraising mode" with our Ministry Partners. We like all our ministries to have a solid and realistic plan for this important time. Pray that all of our upcoming meetings with Ministry Partners will be productive and encouraging for all.